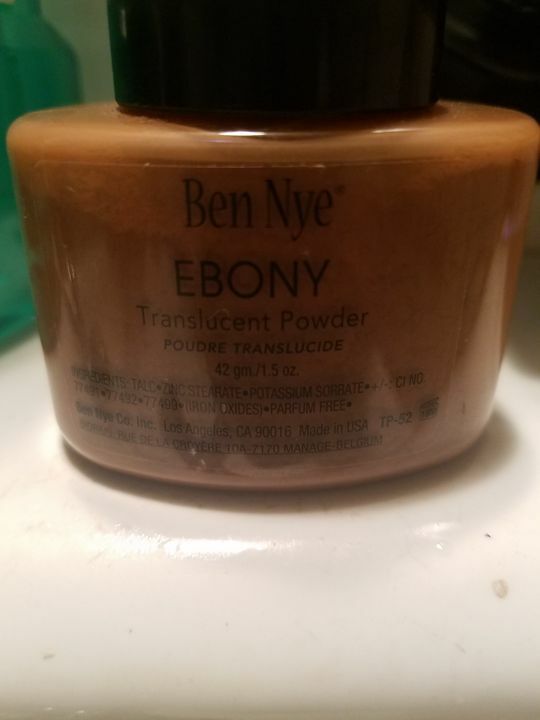 Ben Nye's Ebony Classic Translucent Face powder sets creme makeup for a durable, soft matte finish! Find your match in 9 shades ranging from fair to cool, to the rich, deep brown! Please Note: We do not sell to resellers. This product does not always come from the manufacturer with a seal. Settling is normal and may cause the container to look less than full. *Due to high demand and limited supply, this product is limited to 6 per color, per client with exception to cosmetic schools, instructors, theater, stage or production companies and organizations. **Ben Nye Classic Translucent Face Powder are exempt from discount coupons of any kind and are not sold to resellers or in bulk. Camera Ready Cosmetics is an Authorized Dealer of Ben Nye. For questions regarding product authenticity of any Ben Nye product, please contact them directly at 310-839-1984. Ebony: Talc; Zinc Stearate; Ci No. 77163 (Bismuth Oxychloride); Diazolidinyl Urea; Methylparaben; Propylparaben; May Contain: Ci No. 77489; 77491; 77492.; 77499; (Iron Oxides); Parfum Free. C.C. S. Reviewed by C.C. S.
Ebony is great for contouring, the pigments are dark brown. There is no golden, pink, or red under tones to it. Tori P. Reviewed by Tori P.
Powders have an anazing texture that melts into the skin! Bukola A. Reviewed by Bukola A.
Aretha O. Reviewed by Aretha O.
Tierra W. Reviewed by Tierra W.
The translucent powder is great. The translucent powder is great. Does not make my dark skin ashy.